Donald Trump got elected in 2016 essentially by promising everything to everyone except immigrants and environmentalists. In the economic realm he vowed to resurrect dying industries such as coal, to achieve trade supremacy over the rest of the world, to dismantle the regulatory state, and to bring about growth rates not seen for decades. Now those corporate executives who sold their soul to Trump are realizing he cannot deliver on all those promises. This epiphany took a while to happen because most of Trump’s previous dubious initiatives were domestic in nature. Large corporations stood by as the administration and Congressional Republicans went after the Affordable Care Act because the main victims were individuals who did not get employer-sponsored coverage but were not poor enough to qualify for Medicaid. They went along with the tax bill because it enriched them handsomely even as it set the stage for future fiscal distress. They were largely silent as Trump’s plans to rebuild infrastructure and to address the opioid crisis fizzled out. 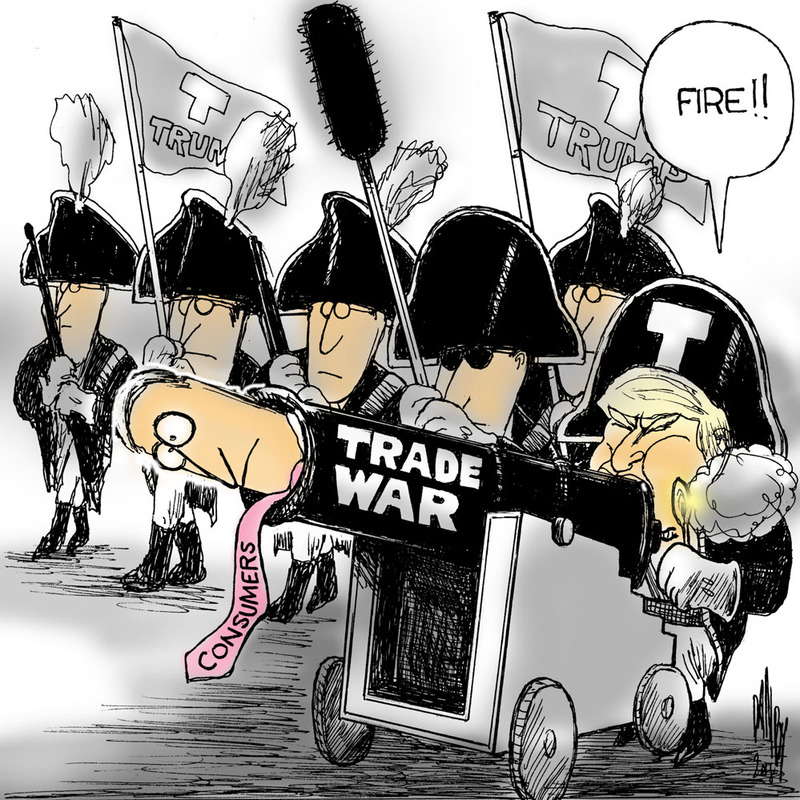 Yet trade involves other countries, whose leaders and citizens are a lot less in thrall to Trump and don’t seem to take his bullying routine very seriously. Even mild-mannered countries such as Canada are showing plenty of backbone. Meanwhile, countries such as China, which have engaged in unfair practices that should be addressed in a more coherent way, are able to take the moral high ground. While Trump is not budging, this foreign resistance is starting to close markets and raise costs for a long list of domestic industries. Globalized companies cannot afford to follow Trump on the road to autarky. For some big firms the European market, for instance, is as important or even more important than the domestic one. Yet it is not clear that Corporate America is willing to stand up to Trump in a major way. Rather than challenge the president directly, they may simply shift investment and sourcing to lessen the impact of the trade barriers. We need not worry too much about GM and Harley. The problem is that the trade standoff will eventually take its toll on the U.S. economy as a whole, threatening the delicate balance of low unemployment and mild inflation while hastening the arrival of the next recession. And that will hurt Trump’s individual supporters a lot harder than his corporate backers. Exporting Hazards or Globalizing Regulation? 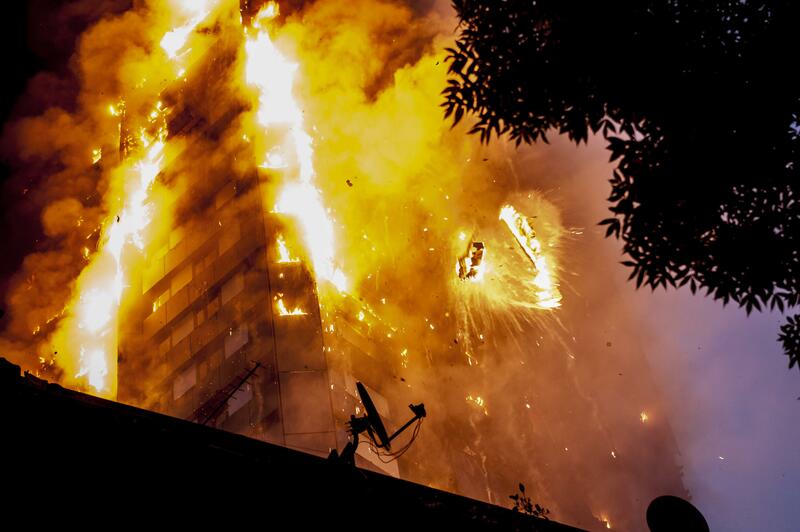 Americans may have initially felt a bit smug upon learning that the combustible material responsible for the Grenfell Tower disaster in London is largely banned in the United States. Perhaps our regulatory system is not as deficient as we thought. That moral superiority went out the window when it came to light that the deadly cladding was purchased from an American-based company. Some of the outrage being exhibited toward public officials in Britain should also be aimed at Arconic, a company created from the break-up of the aluminum giant Alcoa. Arconic has announced that it will suspend sales of the cladding, known as Reynobond PE, for high-rises, but that does little good for the scores of people killed in the Grenfell fire or the thousands of others who have been forced to leave other apartment houses now found to contain the material. Although most of the attention is on Arconic’s cladding and its role in spreading the conflagration, it turns out that fire itself was caused by another American product, a refrigerator made by Whirlpool under its Hotpoint brand. The appliance had a back made out of flammable plastic rather than the metal typically used in models sold in the United States. The London Fire Brigade had long lobbied, to no avail, to require new appliances to have fire-resistant backing. The sale of banned products in offshore markets is, unfortunately, a longstanding practice among U.S-based multinational corporations. What’s unusual in this case is that the offshore market is a wealthy country such as Britain, whereas the dumping is normally done in poor countries. As Russell Mokhiber points out in his 1988 book Corporate Crime and Violence, one of the earliest examples was that of the now defunct company A.H. Robins, which in the 1970s sold thousands of its Dalkon Shield intrauterine contraceptive devices in 42 countries even after it became apparent that thousands of U.S. women were experiencing severe and sometimes deadly ailments linked to the IUDs. In 1972 the U.S. Environmental Protection Agency prohibited most uses of the insecticide DDT, yet American producers continued to sell in foreign markets for years until most other countries adopted their own bans. U.S. companies also continued to export dangerous products such as asbestos, flammable children’s pajamas and lead-based house paint after being barred from selling them in domestic markets. These practices illustrate the perverse way that most large companies regard the regulation of their business. They are not willing to admit that restrictions are legitimate — even when imposed in the wake or injuries and deaths — and will adhere to them only to the extent absolutely necessary. If they can continue to sell products they have been told are harmful to some customers, they will do so. This mindset seems to result from both a knee-jerk ideological opposition to all regulation and an amoral pursuit of profits. The persistence of corporate crime suggests that attempting to reform big business from within — the dubious promise of corporate social responsibility — is far from adequate. Just as markets have superseded borders, so must regulation be globalized. Posted in Corporate Crime, Globalization, Product Safety, Regulation | Comments Off on Exporting Hazards or Globalizing Regulation? While some observers insisted that a certain amount of baksheesh was necessary to making deals in many parts of the world, Congress responded to the revelations by enacting the Foreign Corrupt Practices Act in 1977, making bribery of foreign government officials a criminal offense under U.S. law. That laws is still on the books, and despite all the talk of corporate social responsibility, quite a few corporations still get caught in its net. As part of the forthcoming expansion of the Violation Tracker database I produce with my colleagues at the Corporate Research Project of Good Jobs First, I’ve been looking at recent FCPA data and have been struck by the enduring inclination of businesspeople to engage in foreign bribery. Since the beginning of 2010 about 90 companies have been hit with either criminal charges brought by the Justice Department or civil charges filed by the SEC or both. The 53 companies charged by the DOJ had to pay nearly $4 billion to settle their cases, while the 72 firms targeted by the SEC had to pay $1.7 billion. The companies involved in the cases include some very familiar U.S. corporate names, including: Alcoa, General Electric, Goodyear, Johnson & Johnson, Pfizer, Ralph Lauren and Smith & Wesson. Yet some of the biggest penalties have been paid by foreign companies such as the French conglomerate Alstom ($772 million), British military contractor BAE Systems ($400 million), Italian petroleum company ENI ($125 million) and German automaker Daimler ($91 million). That reflects the long reach of the law, which allows for cases to be brought against foreign corporations involving corrupt practices in third countries. For example, the Japanese trading company Marubeni was charged with paying bribes to high-ranking government officials in Indonesia to secure a lucrative power project. Germany’s Deutsche Telekom and its Hungarian subsidiary Magyar Telecom were charged with making illegal payments in Macedonia and Montenegro. From the time the FCPA was enacted, corporate lobbyists have complained about the law and have sought to have it weakened or repealed. The smarter companies have realized that the bribery rules are not going away and that they simply need to clean up their act when doing business abroad. Note: Violation Tracker 2.0 — which will add banking offenses and cases involving price-fixing, money laundering, defrauding of consumers and export-control/sanctions violations as well as foreign bribery — will be released on June 28. Large U.S.-based corporations have long demonstrated that they are willing to put profits before patriotism. Over the past two decades, about two dozen of those companies have moved their legal headquarters offshore in order to drastically reduce their federal tax obligations. This disreputable practice is once again in vogue and being brought to a new level by Pfizer’s effort to acquire AstraZeneca and register the combined operation in the United Kingdom. The big Walgreen drugstore chain is also considering a foreign reincorporation move. During the last big wave of what are politely known as corporate inversions, there was a great deal of protest. The decision by companies such as Tyco International and Ingersoll-Rand to reincorporate abroad was widely denounced as being akin to treason. Reacting to the controversy, Stanley Works dropped plans for a similar move. Today there is surprisingly little anger over Pfizer’s plan. In fact, the business press is filled with articles indicating that numerous other companies are thinking along the same lines. Pfizer is facing some opposition, but it is mainly in Britain, where the company’s CEO Ian Read (photo) was grilled by members of parliament concerned that the merger will have a negative impact on employment at AstraZeneca. While Pfizer has been quite open about the tax dodging aspect of its takeover bid, companies involved in inversions tend to justify their move by emphasizing the global nature of their business. The problem with this argument is that it is not supported by the facts. The companies that reincorporate abroad continue to do more business in the United States than in any other country. For example, the purportedly Irish company Ingersoll-Rand derives 59 percent of its revenues from the United States and has 80 percent of its long-lived assets in that country. Inverted companies usually continue to trade on U.S. stock exchanges and keep their real headquarters at home. They also continue to win contract awards from the federal government. Accenture, another company claiming to be Irish, does more than $1 billion a year in business with Uncle Sam. If Pfizer succeeds in its bid, it would add another $200 million to this list, plus $9.2 million that has gone to AstraZeneca’s U.S. operations. Walgreen has received more than $12 million in subsidies. Along with showing little loyalty to the United States, the corporate tax traitors do not hesitate to abandon their adopted countries when it is financially advantageous to do so. A number of the companies that had reincorporated in Bermuda and the Cayman Islands in the late 1990s and early 2000s subsequently moved to Europe. These include Ingersoll-Rand, Tyco International and Seagate Technology. Doing so allowed them to avoid the stigma and legal complications of being based in Caribbean tax havens while still enjoying the relatively low corporate tax rates provided by countries such as Ireland and Switzerland. Britain, the intended new home of Pfizer, is now also regarded as one of the more respectable tax haven destinations. While pretending to be Irish or Swiss or British may be regarded as more acceptable than pretending to be Bermudan, what these companies are doing is still brazen tax dodging and a betrayal of the country that helped them grow into corporate behemoths in the first place. After the inversion controversies of the early 2000s, Congress took action that thwarted the practice. In today’s political climate in Washington, it is unlikely that restrictions will be placed on the new generation of runaway corporations. Business apologists are already using the Pfizer deal not as a call to arms to block more relocations but rather as an argument for giving in to longstanding demands to gut what remains of the corporate income tax. According to this warped logic, the United States will solve the tax haven problem only by becoming one itself. It’s been clear for a long time that oil drilling in Ecuador’s rain forests dating back to the 1960s caused severe environmental damage. Yet for more than two decades a lawsuit against the lead drilling company, Texaco, and its new owner, Chevron, has meandered through Ecuadoran and U.S. courts. Chevron, fighting a $19 billion judgment against it in Ecuador (later reduced to $9.5 billion), has sought to turn the tables on the plaintiffs and their U.S. lawyer, Steven Donziger. Recently, a U.S. court ruled in favor of the company, bolstering its refusal to pay anything in compensation. The challenges faced by the plaintiffs in the Chevron case are, unfortunately, the rule rather than the exception. It is often next to impossible to get a large transnational corporation to fully rectify serious environmental, labor or human rights abuses. In some respects the corporate model is antithetical to the right to effective remedy; by admitting and addressing human rights abuses companies expose themselves to financial liability and reputational harm which shareholders (if not the directors and officers of the company themselves) see as entirely contrary to their interests. Amnesty amplifies its analysis through four detailed case studies. The first is the 1984 Bhopal catastrophe, in which a massive leak of toxic methyl isocyanate gas at a facility owned by a subsidiary of Union Carbide killed thousands and caused debilitating illnesses in tens of thousands more. Union Carbide paid what the victims considered grossly inadequate compensation while its CEO, with the help of the U.S. government, evaded extradition on criminal charges. Dow Chemical, which acquired Union Carbide in 2001, has refused to do anything more to help the victims. The other situations examined in the Amnesty report are not as well known. The first is the Omai gold mine in Guyana, where the rupture of a tailings dam in 1995 spilled a vast quantity of effluent laced with cyanide and heavy metals into two rivers. The mining operation and the dam were run by Omai Gold Mines Limited, a company controlled at the time by Canada’s Cambior Inc. Soon after the accident, Cambior paid out modest amounts in compensation to local residents while vigorously contesting legal actions brought both in Guyana and in Canada. The company, which later merged with another Canadian firm, Iamgold, never paid out anything more. Amnesty’s third case study deals with the Ok Tedi mine in Papua New Guinea, where for many years waste products were dumped into a river used by some 250 communities of indigenous people. In 1994 a lawsuit on behalf of local residents was filed in Australia, the home country of the company, Broken Hill Proprietary, which at the time was the primary operator of the mine. BHP, now part of BHP Billiton, eventually agreed to an out-of-court settlement that included the equivalent of $86 million in compensation but did not require it to build a long overdue tailings dam. The final case study in the Amnesty report is also the most recent. In 2006 the Dutch oil trading company Trafigura signed a dubious agreement with a small firm in Ivory Coast that allowed it to dump petroleum waste products at various sites in the city of Abidjan. Thousands of residents exposed to the substances suffered from nausea, headaches, breathing difficulties, stinging eyes and burning skin. At least 15 were reported to have died. Trafigura reached a settlement that Amnesty labels as insufficient. Amnesty finishes its report with an analysis of what it calls the three biggest obstacles in such cases: the legal hurdles to extraterritorial action, the lack of information needed to support claims for adequate reparations and the unwillingness of the governments of the countries involved to hold foreign corporations to full account. While offering a set of reforms aimed at alleviating these challenges, Amnesty harbors no illusions about the difficulty of bringing about such changes. Legal systems, it admits, exist primarily to protect powerful corporate interests. Global corporations piously claim to adhere to the laws of the countries in which they do business, knowing full well that those laws in many places are weak or are not rigorously enforced. It’s thus amusing to see British drug giant GlaxoSmithKline squirm in the face of corruption charges unexpectedly brought by the Chinese government. GSK purports to be shocked by allegations that its Chinese executives used funds laundered through travel agencies to bribe doctors, hospitals and public officials to purchase more of its products. The company insists that it has zero tolerance for such behavior and that a recent internal investigation had found no evidence of corruption in its Chinese operations. These protestations are as unconvincing as the Chinese government’s claims that it is simply enforcing the law—as opposed to giving its emerging pharmaceutical industry a leg up. GSK’s alleged transgressions are little different from the practices that it and the rest of Big Pharma employ around the world. Take the United States. In recent years, GSK has become known as the company that pays massive amounts to resolve wide-ranging allegations brought by regulators and prosecutors. Some of those charges involved payments very much like the ones it is being accused of making in China. GSK was charged with giving kickbacks to doctors and other health professionals to prescribe drugs such as the anti-depressants Paxil and Wellbutrin for unapproved (and possibly dangerous) purposes. Payments also went to figures such as radio personality Drew Pinsky, who was given $275,000 by the company to promote Wellbutrin on his program. The kickback allegations were among the charges covered by a $3 billion settlement GSK reached with the U.S. Justice Department in 2012. Also included in the deal were accusations that GSK withheld crucial safety data on its diabetes medication Avandia from the Food & Drug Administration and that it defrauded government healthcare programs in its pricing practices. These safety and pricing matters were the culmination of years of controversy surrounding GSK and its predecessor companies. The safety issues dated back at least to the 1950s, when Smith, Kline & French was among the firms linked to Thalidomide and its horrible legacy of birth defects. Until it was sold off in the late 1980s, Glaxo’s infant formula business, like that of Nestle, was accused of undermining public health in the third world by marketing the powder to women who were so poor that they tended to dilute the formula to the point that it lost its nutritional potency. In the 1980s, SmithKline Beckman was the target of a rare criminal case brought under U.S. drug laws for failing to warn regulators and the public about the potentially lethal side effects of its blood pressure medication Selacryn. Later years saw frequent charges that GSK suppressed evidence about the dangers of Paxil, especially in children. There were also many cases involving pricing abuses, including one in which GSK paid $150 million to resolve allegations of violating the federal False Claims Act in its dealings with Medicare and Medicaid. Unlike many corporate settlements, GSK’s $3 billion deal with the feds required it to plead guilty to several criminal counts. It also had to sign a Corporate Integrity Agreement with the Department of Health and Human Services. In other words, the company is in effect on parole and subject to heightened scrutiny. The Chinese accusations seem to point to a big, fat violation of the U.S. Foreign Corrupt Practices Act. That would jeopardize GSK’s settlement and subject it to new penalties and sanctions. Foreign corporations have long taken advantage of China’s lax regulatory system. Now that the People’s Republic is (selectively) cracking down, a company such as GSK deserves no sympathy. It’s difficult to decide which company is acting in the more irresponsible fashion in the wake of the terrible Rana Plaza industrial accident in Bangladesh: Wal-Mart, which continues to source goods from the country but refuses to join a group of other companies in signing a binding agreement to improve factory conditions; or Disney, which simply decided to end its use of suppliers in Bangladesh and several other countries. Both companies have a dismal record when it comes to sourcing from poor countries. Wal-Mart has been embroiled in controversies regarding labor practices by its foreign suppliers since at least 1992, when media outlets such as NBC’s Dateline reported that some of the company’s Asian suppliers were making use of illegal child labor. In 2005 the International Labor Rights Fund filed suit against Wal-Mart in federal court in Los Angeles, charging that employees of the company’s suppliers in China, Bangladesh, Indonesia, Swaziland and Nicaragua were forced to work overtime without pay and in some cases were fired for supporting union organizing efforts. Unfortunately, the case was thrown out on legal technicalities. After a November 2012 fire at a Bangladeshi garment factory supplying Wal-Mart and other Western companies killed more than 100 workers, the Wall Street Journal found that the factory managed to continue working for Wal-Mart despite third-part inspections that had raised concerns about fire safety. Disney has been targeted over conditions in its foreign supplier factories since 1996, when a report published by the National Labor Committee (now the Institute for Global Labour and Human Rights) alleged that clothing contractors in Haiti producing “Mickey Mouse” and “Pocahontas” pajamas for U.S. companies under license with Disney were in some cases paying as little as 12 cents an hour, below the minimum wage in that country. In a follow-up report, the group found that the contractors had raised wages to the legal minimum of about 28 cents an hour but said this still left workers living “on the edge of misery,” especially since they were often short-changed by employers. Over the following two decades, groups such as China Labor Watch and Hong Kong-based Students and Scholars Against Corporate Misconduct (SACOM) have produced a steady stream of reports documenting abuses in Disney supplier factories, especially in China, concerning wages, working conditions and safety. The company has generally brushed off the criticism, saying it could not possibly monitor all of the facilities. It even refused to release a list of its supplier factories. It thus comes as no surprise that neither Disney nor Wal-Mart is playing a constructive role in helping prevent a repetition of disasters like Rana Plaza. In the case of Wal-Mart, it is likely that the key reasons for its refusal to join with companies such as H&M and Carrefour are that the agreement they signed is legally binding and that international labor federations such as IndustriALL and UNI were involved in making the accord happen. Bangladeshi unions are also signatories to the agreement. Wal-Mart, of course, is notorious for its aversion to any form of cooperation with unions (except the subservient ones in China). In its dealings with community groups and other non-profits, the company is equally infamous for avoiding binding agreements—preferring to give itself the ability to wiggle out of any commitments it may pretend to make. The National Retail Federation, which shares Wal-Mart’s attitude toward unions, defiantly rejected the accord, while The Gap justified its refusal to sign by warning of the possibility of lawsuits. In other words, like Wal-Mart, it apparently wants an agreement that will do little more than burnish its corporate image. The accord is an important step forward in addressing both the immediate problem of industrial safety in Bangladesh and in starting to make large corporations truly responsible for ameliorating the brutal working conditions they all too often help create in countries with large numbers of desperate workers. Note: This piece draws from my new Corporate Rap Sheet on Disney, which can be found here. The U.S. Securities and Exchange Commission often behaves like a watchdog with no teeth, but it has just stood up to intense pressure from big business and finally approved two rules that will shine a light on dealings between some of the world’s largest corporations and the poor countries from which they extract vast amounts of natural resources. One of the final rules will require companies engaged in resource extraction to report on all payments to foreign governments, such as taxes, royalties, fees and presumably bribes. The other will require companies to disclose their use of certain resources originating in the Democratic Republic of Congo, where warring groups that have committed frequent human rights violations finance themselves through the sale of what are known as conflict minerals, which can end up being used in the production of goods ranging from jewelry to iPhones. These rules derive from some of the lesser known provisions of the 2010 Dodd-Frank financial reform legislation, which the corporate world has been seeking to undermine in the rulemaking process after losing in Congress. Business lobbyists have fought the same kind of rear-guard action against the disclosure requirements that they have mounted in opposition to the central portions of Dodd-Frank. Exxon Mobil seconded API’s positions but also threw in the preposterous argument that the disclosure rule could be harmful by “inundating and confusing investors with large volumes of data.” Chevron argued that the information should be submitted to the SEC on a confidential basis, and the agency would then make public only aggregate amounts by country. It also urged the SEC to limit reporting to payments of a “material” amount, which would have meant that only huge ones would be revealed. It takes a lot of chutzpah on the part of Chevron and Exxon Mobil to resist greater transparency, given that predecessor companies of theirs were at the center of the scandals that first brought the issue of questionable foreign payments to national attention in the 1970s. Congressional investigations of the Nixon Administration’s Watergate crimes also brought to light widespread corruption by major corporations in the form of illegal campaign contributions and payoffs to foreign government officials. Under pressure from the SEC, these companies investigated themselves and disclosed what they found. Exxon (prior to its merger with Mobil) admitted to making more than $50 million in foreign payments that were illegal, secret or both. Gulf Oil (which later merged into what is now Chevron) admitted to more than $4 million in such payments, including $100,000 used to purchase a helicopter for one of the leaders of a military coup in Bolivia. Smaller oil companies also spread around the cash. Ashland Oil, for example, paid $150,000 to the president of Gabon to retain extraction rights. Foreign payoffs were not unique to the oil industry. Aerospace giant Lockheed disclosed more than $200 million in questionable payments, while its competitor Northrop admitted to $30 million. The revelations extended to numerous other sectors as well. These revelations seriously tarnished the image of big business and paved the way to the enactment of the Foreign Corrupt Practices Act. They were also a big part of the impetus for the modern corporate accountability movement, which has put expanded disclosure at the center of its reform agenda. It is thus no surprise that corporate accountability and human rights groups—many of which participate in the Publish What You Pay coalition—promoted the inclusion of the disclosure provisions in Dodd-Frank and welcomed the SEC’s vote to move ahead with the rules. Yet there is frustration that on several points the agency caved in to industry pressure. Global Witness, for instance, said it was “extremely disappointed” that the final rule concerning conflict minerals gives larger companies two years and smaller ones four years to determine the origin of the minerals they use. The SEC also acceded to the demands of giant retailers such as Wal-Mart and Target that they be exempt from conflict minerals reporting requirements relating to products sold as store brands but produced by outside contractors not operating under the retailer’s direct control. Efforts by large companies to weaken the disclosure rules are yet another sign of how they resist serious regulation in favor of less onerous industry initiatives. Many of those arguing against the proposed SEC rules said they were unnecessary given the existence of the Extractive Industries Transparency Initiative. The EITI is laudable, but it is voluntary and less than fully rigorous. Business never gives up on its effort to make us think that, despite the prevalence of corporate crime, it can police itself. It has never done so effectively and never will. Recent passage of a piece of federal legislation on a broadly bipartisan basis was considered unusual enough for the Washington Post to treat it as front-page news. Yet what was most significant about the measure to extend the life of the U.S. Export-Import Bank was not its bipartisanship but rather the way it revealed a profound confusion on the part of both major political parties about how the federal government should relate to big business. Supposedly anti-corporate Congressional Democrats joined with the likes of the U.S. Chamber of Commerce and the National Association of Manufacturers to defend the Ex-Im Bank. House Democratic Leader Nancy Pelosi said that Congress had to send “a strong signal to American businesses: we will help them get their products into markets abroad, and in doing so, we will create jobs here at home.” Independent Vermont Senator Bernie Sanders, on the other hand, maintained his long-time opposition to the bank. In the end, the corporatist wings of the two major parties prevailed, but not before the Ex-Im Bank had been pummeled by conservatives who had begun denouncing the institution as “Boeing’s Bank.” They have a valid point. A huge portion of the agency’s resources have long been devoted to that one company. If you look at the list of loans and long-term guarantees in the bank’s annual report, Boeing’s name shows up repeatedly—more than 40 times last year, far more than any other company. The company got assistance in its deals to sell planes to airlines in more than 20 countries such as Angola, Indonesia and Tajikistan. Eliminating Ex-Im Bank’s credit assistance was high on the list of programs proposed for elimination in the Aid for Dependent Corporations reports issued by the Ralph Nader group Essential Information in the 1990s. By that point libertarian groups such as the Cato Institute were also speaking out against the bank and other forms of corporate welfare. Also lining up against the bank were environmental groups concerned about its role—along with that of the Overseas Private Investment Corporation—in enabling hazardous projects such as the Three Gorges Dam in China. The contemporary right’s misgivings about the Ex-Im Bank have nothing to do, of course, with anti-imperialism or environmental protection—and everything to do with absolutist ideas about the role of government. The problem these conservatives face is that the actual behavior of large corporations frequently bears little resemblance to pure free-market principles. Boeing, for instance, is not only perfectly willing to accept federal export assistance but has also sought and obtained billions of dollars in state and local economic development subsidies for its U.S. plants. Its decision to locate a Dreamliner production facility in South Carolina garnered a subsidy package estimated to be worth more than $900 million. The company’s hold over the Palmetto State is so strong that it drove a wedge between South Carolina’s two paleo-conservative U.S. Senators during the Ex-Im debate, with Jim DeMint holding to laissez-faire principles while Lindsey Graham warned that eliminating the bank would jeopardize aerospace jobs. When it comes to labor relations issues, Boeing suddenly turns into an ardent opponent of government. When the National Labor Relations Board took seriously an allegation by the Machinists that the company’s investment in South Carolina was a form of anti-union retaliation, Boeing screamed bloody murder and got support from all of the state’s leading politicians—and most of the corporate world. It will be interesting to see how conservatives handle this tension between lionizing large corporations and demonizing them. The outcome of the Ex-Im debate suggests that, for now, corporatists retain the upper hand across the mainstream political spectrum.